We have good evidence from art in early human caves that the human species is older than 40,000 years. But the earliest past of humanity is very murky indeed. For decades scientists have been dogmatically speaking as if they understand the origin of the human race. We are told that this occurred when man evolved from more primitive ancestors with smaller brains, through a Darwinian process of natural selection and random mutations. But the evidence cited for such claims has always been weak. But today's evolutionary biologist would claim that the modern case for human evolution is much better, because of fossil evidence. We are told that paleontologists have found a series of fossils belonging to creatures with brains midway between the size of a human brain and the size of a chimpanzee brain. But there is a reason why such fossils do not by themselves establish any claim of lineage or ancestry. The reason is that quite possibly there existed during the past 5 million years a variety of anthropoid species which were not ancestors of the human species; and in such case there would have been the same fossil record that we have discovered, even if mankind did not evolve from any of those species. Such a chart could be presented as a “Chart of Evolution” suggesting a progression from Species X to Species Y, and then a progression from Species Y to Species Z. But there would not actually have been such a progression. In fact, in this case there is no ancestry at all between any of these species. That's an example of how “Charts of Evolution” can be made by cherry-picking data, and arranging them in a linear sequence to encourage people to believe in a progression that did not actually occur. Here is another example. Imagine you go to the Columbia University library, and find some old university yearbooks. You could choose from 1970 a picture of a short, very fat student. Then from from 1980 you could choose a picture of a slightly short, slightly fat student. Then from 1990 you could choose a picture of a student of average weight and height. Then from 2000 you could choose a student of a rather tall and slightly muscular student. Then from 2015 you could choose a picture of a tall and very muscular student looking like a football tight end. You could then arrange these pictures chronologically in a series you might entitle “Evolution of the Columbia Student.” Such a series would give someone the completely erroneous idea that students at Columbia have evolved from being very fat and short to being tall and muscular. But such a chart would be very misleading. Such examples should make us pretty suspicious of the standard “Chart of Evolution” showing some ape-like species evolving over millions of years to become man. Such charts don't show the likelihood of such a progression, but merely show the possibility of such a progression. We may become more doubtful when we consider that visual representations of past species are largely speculative. Fossils of claimed human ancestors are all fragmentary. An example is the famous Lucy skeleton, where we have but a few small pieces of a skull and some other small bone fragments. We see charts listing the brain sizes of organisms corresponding to such fossils, but the numbers in such charts are guesswork, since we don't have any fossilized brains. We may wonder whether the numbers supplied in such charts are numbers arbitrarily chosen to fit in with orthodox assumptions about evolutionary transitions. We should remember that almost every account of fossil evidence coming from orthodox biologists, paleontologists and anthropologists is likely to be biased, slanted and speculative, because such scientists (trained in ideological enclaves resembling seminaries) are tribal conformists peer-pressured into peddling a particular Darwinist belief system based on the assumption that humans descended from lower species. But is there some evidence that might make ideas of human ancestry better founded? In theory, there could be: DNA evidence. If you were able to have complete DNA that corresponded to each of the fossils in a fossil series, you would be on much firmer ground drawing conclusions about ancestry. But in this case our paleontologists do not have what they would like to have. This is one of the dirty little secrets of modern evolutionary biology. Our evolutionary biologists do not have the DNA evidence they need to solidify the claims they make about human origins. The problem is that regular organic material rots in less than a few thousand years, and you can't get much DNA from a very old fossil bone. The half-life of DNA is 521 years. So we don't have any adequate DNA evidence from Homo erectus or Homo habilis, which are claimed to be ancestors or evolutionary cousins of the human species. The oldest DNA from a claimed human ancestor is a scrap of DNA dating back 400,000 years. But this is only about 16,000 base pairs, and the human genome is 3.2 billion base pairs. Such a tiny scrap doesn't give you a hundredth of what you would need to genetically verify that such an organism was an ancestor of humans. Imagine a trial in which the prosecution needed some blood photographed at a crime scene corresponding to the blood of the person being tried. But imagine the blood was washed away before its DNA was checked, so no DNA match was made. That's the kind of position our evolutionary biologist is in. He really needs some complete Homo erectus DNA or Homo habilis DNA to back up his claims that these are human ancestors. But no such DNA exists, merely a rare scrap here and there. Some scientists try to use mitochondrial DNA obtained from fossils, but no reliable conclusions can be drawn from such DNA (mitochondrial DNA has less than 1% of the genetic material found in regular DNA). In 2017 bbc.com had a long article entitled “We have still not found the missing link between us and apes.” The article discusses the history of postulating a common ancestor linking current ape-like animals and humans. What we get is a story of a great deal of disagreement and changes in the prevailing narrative. Referring to a "last common ancestor" or LCA, we are told, “Surprisingly, the last 15 years has actually seen popular opinion begin to swing away from the idea of a chimp-like LCA, and towards a model closer to that argued by people like Strauss in the 1940s.” Of one analysis, we are told, “One of the implications of their interpretations was that all sorts of anatomical features shared by gibbons, orangutans, chimps and gorillas must have evolved independently in each of these apes.” That claim should raise suspicions, as such coincidental independent evolution is highly improbable. "There has been a community shift, where people have begun to question what was an emerging consensus for a chimp-like LCA," says Young. But even that is not the end of the story. 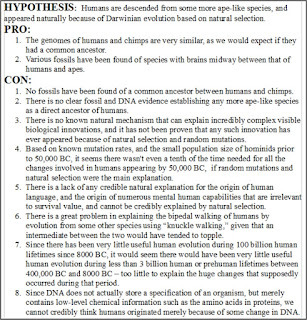 There are still "chimp-like LCA" advocates out there, and they are fighting back...Of course, only if and when fossils of the LCA itself come to light will the debate finally draw to a close.….It is possible, they say, that the LCA might actually have lived 13 – not seven – million years ago....There are also a few researchers who take a completely different view. For instance, Schwartz is adamant that it is orangutans, not chimpanzees, that are our sister species." 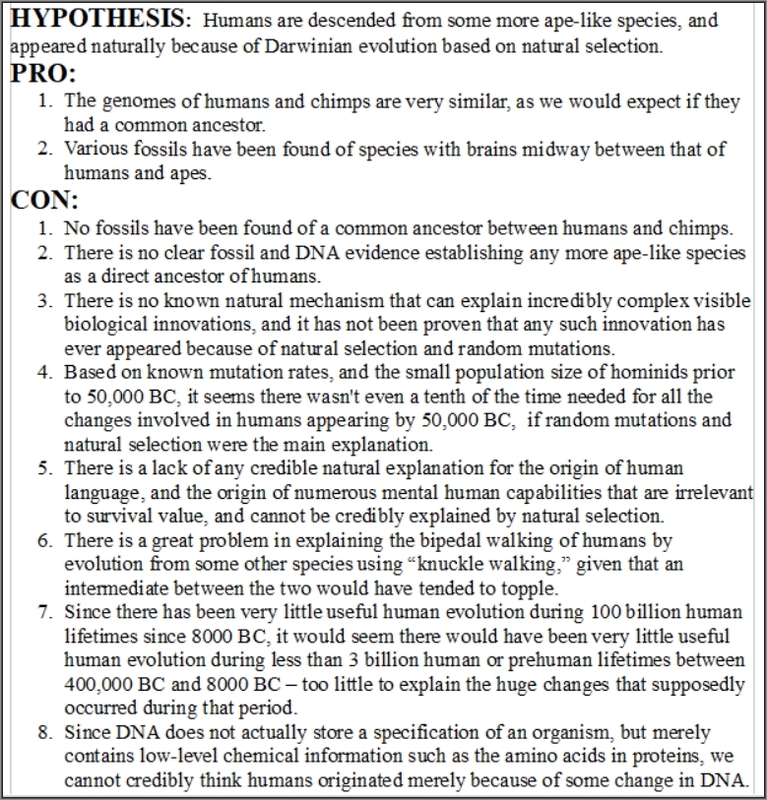 A scientific article tells us, “Few fields of research are subject to so many competing hypotheses, as illustrated by the variable number of ancestral species assigned to the human lineage by different authors, ranging from four to a maximum of 25.” Such gaps and disagreements should not at all inspire our confidence that scientists have a firm gasp on this matter. The scientists are apparently fighting among themselves, disagreeing about the most basic things, and missing many of the fossils they need. We still do not have a good fossil candidate for the phenotypic LCA of Neanderthals and modern humans. This result is striking because confidence intervals of ancestral reconstructions are very broad, which means that existing candidates are very incompatible. (1) We have not found a common ancestor between Neanderthals and humans (that ancestor, which we can call Missing Link 1 is represented in the chart as a question mark). (2) We have not found a common ancestor between this Missing Link 1, Homo erectus and Homo florensis (that ancestor, which we can call Missing Link 2, is represented in the chart as a question mark). (3) We have not found a common ancestor between this Missing Link 2, Homo rudolfensis, Homo habilis and Australopithecus sediba (that ancestor, which we can call Missing Link 3, is represented in the chart as a question mark). (4) We have not found a common ancestor between this Missing Link 3, Australopithecus africanus, and Australopithecus afarensis (that ancestor, which we can call Missing Link 4, is represented in the chart as a question mark). Each of these four missing links, according to the paleontologist's chart in this book, are in the direct path of human ancestry, and none of them are missing links in side detours. But is it really believable that we would be lacking in fossils for four different species that are human ancestors in the past few million years? There is also inconsistency in these charts. Some of these charts list Australopithicus africanus as a direct ancestor of humans, while the “Almost Human” chart does not list Australopithicus africanus as a direct ancestor of humans. Some of these charts list Homo erectus as a direct ancestor of humans, while others indicate Homo erectus was not a direct ancestor of humans. Dogmatic theorists often try to kind of "prove things with language" by referring to species such as Homo erectus as humans. Such language is erroneous. It is illegitimate to use the word "human" to refer to any species which did not show evidence of language or symbolic activity, and such alleged human predecessors as Homo erectus did not show such a thing. Art and symbolic activity appeared rather suddenly about 50,000 - 70,000 years ago. As for the habit of grouping mankind with other species in a genus called Homo, it is merely an arbitrary and dubious classification choice, particularly now that there is such a physically diverse group of species put in that genus, with brain sizes varying by 300% (for example, Homo floresiensis had a brain size only a third as big as humans). "Homo sapiens has been proposed as derived from H. heidelbergensis via Homo rhodesiensis, present in East and North Africa from around 400,000 years ago. The correct assignment of many fossils to a particular chronospecies is difficult and often differences in opinion ensue among paleoanthropologists due to the absence of universally accepted dividing lines (autapomorphies) between Homo erectus, Homo heidelbergensis, Homo rhodesiensis and Neanderthals. It is uncertain whether H. heidelbergensis is ancestral to Homo sapiens, as a fossil gap in Africa between 400,000 and 260,000 years ago obscures the presumed derivation of H. sapiens from H. rhodesiensis....The delineation between early H. heidelbergensis and H. erectus is also unclear. Given the evidence, it means there is no direct evidence that suggest the Homo heidelbergensis is related to modern-day humans." Such a statement should shock every person who believes that humans are descended from more ape-like ancestors. The statement tells us that there is "no direct evidence" that this best candidate for a human ancestor is related to modern-day humans. Another line of evidence offered for human evolution is evidence of the use of stone tools, or the use of fire, or burials, dating from way before 100,000 B.C. Here is where some surprising new findings come into play to cast doubt on some of these claims. As for the use of fire long before about 100,000 BC, none of it is very conclusive. It's all but impossible to distinguish between fires started deliberately and fires accidentally arising from forest fires or lightning strikes. Most of the claims of fire use long before 100,000 BC seem like “face in the clouds” or “Jesus in my toast” kind of claims, in which we can wonder whether the person making a claim is simply finding something that he hoped to find. It is also possible that some species that was not a human ancestor was able to occasionally make fires. Fire-making is just an example of tool-use, and there are other species that make use of tools. Fire-making does not involve the symbolic manipulations that are a hallmark of a human mind. They do not allow us to order human fossils in a gradually progressive and smooth transitional lineage from ape-like forms to modern humans. They also do not fall into a temporal cline from older primitive to younger derived forms. Some early australopithecines not only exhibit the expected ape-like features but also some very modern human characters, while some late representatives of Homo (e.g., Homo naledi) still have very primitive characters. Thus fossil humans do not form a transitional series like the famous horse series. According to Darwinist dogma, lucky random mutations occur and cause "classic sweeps" or "classic selective sweeps" in which some new trait becomes more and more common in the gene pool, eventually so common that most organisms in the population have that trait. This dogma has recently struck out at the plate, as more sensitive scans of the human genome have found little evidence of such classic sweeps. A scientific paper was entitled "Classic Selective Sweeps Were Rare in Recent Human Evolution." By "recent human evolution" the paper meant the past 250,000 years. Another recent scientific study in 2014 found there was virtually no sign of adaptive evolution in the human genome. The paper published in a mainstream science journal looked for traces of natural selection by looking for something called “fixed adaptive substitutions” in human DNA. The paper stated, “Our overall estimate of the fraction of fixed adaptive substitutions (α) in the human lineage is very low, approximately 0.2%, which is consistent with previous studies.” It's hard to imagine a bigger fail or flop for Darwinian explanations. If such explanations were correct, we would have expected to find such signs of adaptive evolution in a large fraction of the human genome, not a fifth of one percent. In the 2018 book Who We Are and How We Got Here by David Reich, a professor of genetics at Harvard Medical School, the author makes this revealing confession on page 9: “The sad truth is that it is possible to count on the fingers of two hands the examples like FOXP2 of mutations that increased in frequency in human ancestors under the pressure of natural selection and whose functions we partly understand.” Judging from this statement, there are merely 10 or fewer cases where we know of some mutation that increased in the human population because of natural selection. The scientific paper “The Genomic Rate of Adaptive Evolution” tells us “there is little evidence of widespread adaptive evolution in our own species." In the study here, an initial analysis found 154 positively selected genes in the human genome -- genes that seemed to show signs of being promoted by natural selection. But then the authors applied something they called "the Bonferroni correction" to get a more accurate number, and were left with only 2 genes in the human genome showing signs of positive selection (promotion by natural selection). That's only 1 gene in 10,000. Call it the faintest whisper of a trace -- hardly something inspiring confidence in claims that we are mainly the product of natural selection. Given the failure to detect large amounts of adaptive natural selection in the human genome, we should have no strong confidence in the orthodox account that humans appeared because of Darwinian evolution from some ancestor that was the ancestor of both chimps and humans. The number of humans that have lived has been estimated at 100 billion. But a web site discussing this issue tells us that 99% of these people have lived in the past 10,000 years. Since 8000 BC some 100 billion humans have lived, but in the period between about 400,000 BC and 8000 BC, the total number of humans or pre-humans who lived during that period was quite probably no greater than about a billion, and very probably less than 3 billion (the average population size being only about 20,000 for most of this time). But we know there has been very little useful evolution of humans since 8000 BC -- only a few minor things like better lactose digestion and better high-altitude breathing in some people. So if you believe the conventional account, you must believe that a population of no more than 3 billion humans or pre-humans underwent enormous useful evolution (resulting in humans that had language, abstract thinking and symbolic abilities), but that in 100 billion humans living since 8000 BC there has been almost no useful human evolution. Such an idea is not credible. Why would there be so much useful evolution during less than 3 billion lives, and so little useful human evolution during 100 billion lives? We would expect the opposite to be more likely. Just as a prosecutor needs to have explanation of a motive before offering a good case against a defendant, anyone arguing that man was descended from lower species needs to have a believable explanation as to how this occurred. The Darwinian explanation relating to human origins has always been both unproven and implausible. No one has proven or well-substantiated any claim that any impressive case of macroscopic biological complexity ever arose because of a combination of natural selection and random mutations. There is an extremely strong reason for believing that natural selection has never produced any complex macroscopic biological innovation. The reason is that any natural selection related to that particular innovation would only occur after the innovation had appeared. Natural selection simply means the improved reproduction rate that may occur after a biological innovation makes an organism more fit to survive. But such an improved reproduction cannot possibly occur because of some biological innovation until after the innovation appears. So in general, natural selection is never an explanation for a complex visible biological innovation. An explanation is something that occurs before the thing it explains, not after it. Natural selection is a mere filter, capable of filtering out bad designs, but having no power to produce impressive new designs. A tornado will act as a “survival of the fittest” agent to get rid of bad building designs in a town, leaving only the good designs standing. But it would be ridiculous to claim that a tornado produced a useful new building design after passing through a town, using wreckage as building blocks. It seems equally implausible to attribute such creative powers to natural selection. You do not rebut such an objection by claiming that it is the combination of random changes and survival of the fittest (natural selection) that produces wonderful new designs, because we have the same combination of random changes and survival-of-the-fittest when a tornado passes through a town. But the chance of a tornado ever producing a good new design of building is infinitely low. And if humans perished, and a billion tornadoes passed through the towns and cities we left behind, over the course of millions of years, we would still not expect one of the tornadoes to ever produce an impressive new building design. With all their intricate biochemical machinery, the complexity of mammals is billions of times greater than the complexity of buildings. In the book Evolution and Ecology: The Pace of Life by Cambridge University biology professor K. D. Bennett, this mainstream authority comments on speciation (the origin of species). He says on page 175, "Natural selection has been shown to have occurred (for example, among populations of Darwin's finches), but there is no evidence that it accumulates over longer periods of time to produce speciation in the Darwinian sense." Similar comments were made by an MIT professor who wrote a long paper entitled "Inadequacies of Neo-Darwinian Evolution as a Scientific Theory"
Besides the completely general inadequacy of natural selection and random mutations as an explanation for biological complexity, there are other very powerful reasons why the Darwinian explanation of natural selection and random mutations seems to be grossly inadequate to explain the specific claim that humanity evolved from lower species. The first reason is that the human mind has many unique special characteristics that do not serve any purpose of increasing human survival, and which therefore cannot be explained as being the result of natural selection or survival-of-the-fittest. Among these are spirituality, altruism, self-consciousness, introspection, insight, imagination, philosophical reasoning, language skills, mathematical skills, artistic creativity, and aesthetic appreciation. See here for why such things cannot be well explained by natural selection. In his essay "The Limits of Natural Selection as Applied to Man," it was forcibly pointed out by the co-creator of the theory of natural selection (Alfred Russel Wallace) that natural selection cannot explain some of these higher capabilities of the human mind. In fact, in his his 1910 book The World of Life: a Manifestation of Creative Power, Directive Mind and Ultimate Purpose, Wallace argued that natural selection and random variations were very far indeed from being sufficient to account for the wonders of biology. Darwin engaged in some quite laughable counter-reasoning in his book The Descent of Man. Very absurdly, he stated near the beginning of Chapter III of that book, “My object in this chapter is to show that there is no fundamental difference between man and the higher mammals in their mental faculties.” The long chapter that followed contained much very sophistical reasoning and misinformation, such as when Darwin claimed dogs understand many sentences, and when he insinuated in the second-to-last paragraph of the chapter that dogs are kind of spiritual like humans. Such misstatements and bad reasoning do nothing to help with the basic problem. There is a vast gulf between the minds of humans and the minds of animals, and natural selection cannot explain it. That gulf consists of a series of human traits that do not increase survival value in the wild, so such traits cannot have arisen because of natural selection. There are other grave difficulties in the idea that humans evolved from lower species. One is the difficulty of accounting for the origin of spoken language and the biological changes needed for language. This difficulty is so great that it is sufficient by itself to justify very strong doubt about the natural origin of humans through any process humans understand. In this essay I discuss three reasons why the origin of language is inexplicable under orthodox assumptions. Another difficulty is the problem of explaining the origin of bipedalism. A species like a chimpanzee uses its long front arms to help it in walking -- what is sometimes called knuckle-walking. That works well for chimpanzees, because the long arms and the hunched over skeleton of the chimpanzee supports that kind of locomotion. Humans walk erect on two legs. That works well for humans, but only because there are many bone and muscle differences between a man and a chimpanzee, which allow erect walking to occur. The problem is that in order for there to be any evolutionary progression from a species that walked like a chimpanzee to a species that walked like a human, it seems there would have needed to have existed an intermediate species that was halfway between knuckle-walking and upright human-style walking – and it seems that such a species would have been in a disadvantageous state where it was prone to fall over. But according to Darwinian theory based on survival of the fittest, you basically cannot have a progression from highly functional to poorly functional and then to highly functional – because there can be no foresight under such a theory. So accounting for the origin of bipedalism is a nightmare for the orthodox Darwinists, who give us explanations “all over the map” to try to explain this. According to one mainstream web site, “If you ask a roomful of anthropologists” about why humans walk on two feet, “you'd likely get a different answer from each person.” That's hardly reassuring for someone troubled by this problem. 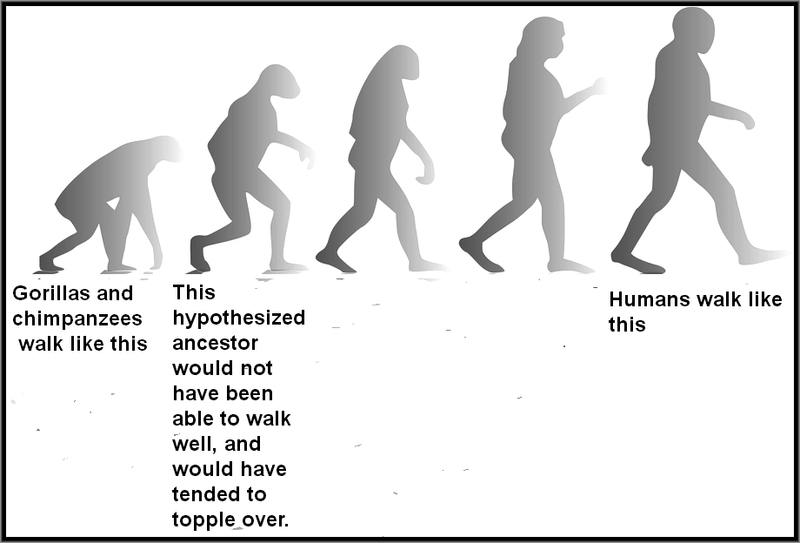 Anthropology professor Henry M. McHenry stated this on page 270 of the mainstream book Evolution: The First Four Billion Years: "The published hominin fossil record does not yet have a true intermediate stage between an apelike and a humanlike body." The "waiting time" problem is another gigantic difficulty. To explain that problem, I must first discuss how it is believed that that the human population was very small at a time such as 100,000 years ago or 200,000 years ago. It is believed that at such a time the human population was probably not much more than 20,000. This paper says "we estimate that the effective population size of human ancestors living before 1.2 million years ago was 18,500, and we can reject all models where the ancient effective population size was larger than 26,000." This scientific papers says, "Resequencing studies have estimated the ancestral effective population size at 12,800 to 14,400, with a 5- to 10-fold bottleneck beginning approximately 65,000 to 50,000" years ago. The problem is that the smaller the population, the less likely that it will be blessed by some fantastically lucky series of random mutations needed for a biological innovation (just as the smaller the pool of lottery ticket buyers, the lower the chance that it will win the grand jackpot). When you have a very small population, it becomes fantastically unlikely that a series of mutations needed for a biological innovation will occur. So how could there have occurred all the helpful random mutations needed for Homo sapiens to appear about 100,000 years ago? The likelihood of such a development seems microscopic. "Biologically realistic numerical simulations revealed that a population of this type required inordinately long waiting times to establish even the shortest nucleotide strings. To establish a string of two nucleotides required on average 84 million years. To establish a string of five nucleotides required on average 2 billion years. We found that waiting times were reduced by higher mutation rates, stronger fitness benefits, and larger population sizes. However, even using the most generous feasible parameters settings, the waiting time required to establish any specific nucleotide string within this type of population was consistently prohibitive." Their paper calculates a "waiting time" of some 2 billion years to get a crummy little five-nucleotide mutation. But the mutations needed for man would have required many times more than five nucleotides – and our Darwinists ask us to believe that they occurred not in 2 billion years but in a span of time less than a thousandth of that. The chance of that seems less than the chance of you winning a hundred million dollars from the Powerball lottery on each of three consecutive lottery drawings. A very important point is that we are not even sure that there ever existed any species that humans might have evolved from, and that had about 50% or 75% of the mental power of modern humans. There seems to have been a hominid species with about 50% or 75% of the human brain size, but mental power is not predictable from brain size. Some species such as crows are amazingly smart with very small brains, while the elephant is nowhere near as smart as man, although its brain is three times bigger than ours. I have already listed quite a few very powerful reasons for doubting that humans understand the origin of humanity, but there are two additional ones of great substance. The first is that we are not remotely close to understanding how a single human adult is even able to originate from a fertilized human egg. The commonly expressed idea on this topic (that the womb or something in it is reading a blueprint of a human stored in DNA) is demonstrably false. Although it lists chemical ingredients used by humans, DNA is not a specification of a human, and does not at all store either a blueprint for making a human or a recipe or program for making humans. The internal limitations of DNA make it impossible that it could be doing such a thing, for DNA uses a genetic code limiting it to very low-level chemical information such as the amino acid contents of proteins. We actually do not at all understand the progression from a fertilized human ovum to a newly born baby. Not understanding such a progression, we are therefore very largely ignorant about the biology of the individual human, and have no business claiming that we understand the far larger question of how our entire species originated. Similarly, if a child has no real understanding of how a house is built, he has no business claiming that he understands how a city originated. Since DNA is not actually a specification of a human, and is not a blueprint or a recipe for making a human, it seems we should reject the Neo-Darwinist idea that humans have appeared merely because of changes in DNA. Another extremely substantial reason for rejecting the claim that we understand human origins is that we have no credible biological account of how the human body can be producing the most impressive aspects of human mentality: consciousness, thinking, imagination, self-hood and memory. The standard claim on this topic is that all such things are produced by the human brain, but such an assertion is merely a speech custom of neuroscientists, not something they have established through observations. There are actually very many strong reasons for thinking that the most impressive aspects of human mentality are things that cannot be produced by the brain. You can read all about such reasons at this site. For example, it is claimed that human memory is stored in brains and retrieved in brains (in the synapses of brains). But we know that the proteins that make up synapses are extremely short-lived, having average lifetimes of only a few weeks -- meaning that the maximum length of time a synapse would seem to be capable of storing a memory is less than a thousandth of the length of time (50 years) that humans can store memories. To give another example, we know synapses and neurons are very noisy things, and that a synapse will transmit an electrical/chemical signal with only about 50% reliability. But a human actor (such as one playing Hamlet) can flawlessly recall 1480 lines, not at all what we would expect if noisy, low-reliable synapses were the basis of such recall. There are very many similar reasons why we must conclude that our brains cannot account for the more impressive human mental capabilities, such as the fact that no one has any coherent explanation of how any such things as abstract ideas, imagination, self-hood or consciousness could arise from any type of matter, whether it be neurons or any other type. If it is true that our brains cannot account for all of human mental capabilities and mental experiences (and there are dozens of reasons for thinking that), then we have no business claiming that we understand human origins, for it would seem that there must be some mysterious factor involved to a gigantic extent in our origins that our biologists do not at all understand. There are so many very serious difficulties and unanswered questions involved in all attempts to explain human origins that we should have no great confidence in any of them. We should not regard it as well-established or fairly certain that humans are descended from any previous species (although such an idea still remains a possibility). The most intelligent opinion about human origins is that such a question is an extremely puzzling mystery that is currently far beyond human understanding. The slang expression of today's overconfident person is: “Don't worry – I got this.” When it comes to explaining human origins, our evolutionary biologists are always telling us, in effect, “Don't worry, we got this.” The reply we should give back to them is: no, guys, you don't got this. Contrary to the insinuations of explanatory dogmatists, we do not at all have a choice between Darwinist orthodoxy and the biblical account of creation. Those are only two of ten or more possible belief options or speculations one can have about the origin of humans, which I will discuss in a later post. Our biologists cannot even explain some of the most important low-level mysteries of biology. Our biologists do not even know how the simplest prokaryotic cell could have originated, and they do not have a credible account of how eukaryotic cells originated (only a very unbelievable tall tale). Our biologists do not even know what causes a cell to split into two copies of itself; they do not know what causes polypeptide chains to fold into the three-dimensional shapes of proteins; they do not know what causes a fertilized ovum to progress to become a human baby; and they do not know how humans are able to remember things for 50 years (despite rapid protein turnover in synapses), and how humans can instantly remember things they learned or experienced decades ago. But even though such basic low-level biological mysteries cannot be well-explained by our biologists, they ask us to believe that they understand something vastly more complicated: the mystery of how human organisms first originated. This is rather like a person who doesn't understand what a boat is telling you he knows how to command an aircraft carrier, or a person who doesn't understand what an atom is telling you he knows how the sun keeps shining, or a person who doesn't understand what a war is or a country is telling you he understands the history of the twentieth century. 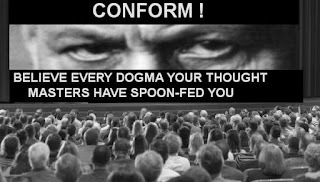 Claims such as "we know what caused man's origin" are pushed dogmatically by conformist branches of academia that show much of the same groupthink, hubris and kneeling to authority that we see in organized religions. When we put aside overconfidence and bluffing brags, and look objectively at the matter with a realistic humility, we should realize that our knowledge of nature is very small and fragmentary, and that the very puzzling question of human origins is one that may well take mankind a thousand years to unravel.